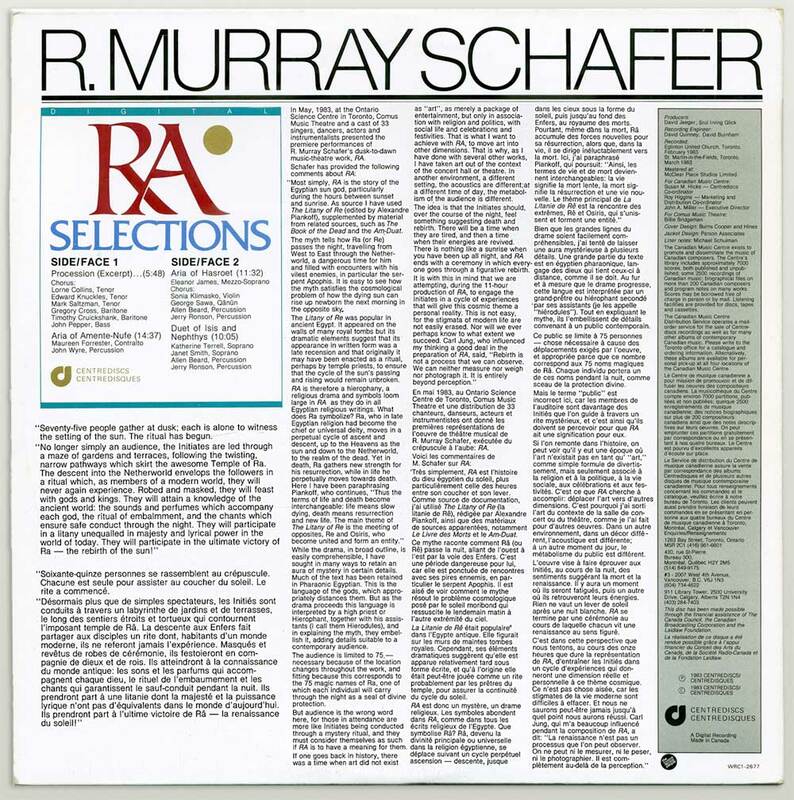 This flexi disc was issued in 1981 for the opening of a Raymond Murray Schafer exhibition at Gallery Stratford, Stratford, Ontario, organized in conjunction with Presentation House, Vancouver. Acknowledging Murray Schafer’s multiple activities as a writer, educator, philosopher, visual artist and composer, the exhibition included graphic scores, drawings, collages, and a sound sculpture build from found objects like “old saw blades, rusty nails, machinery parts”. The Sounds Unseen flexidisc is housed in a fold out, 6-pages cover with texts and pictures, but unfortunately no list of the works exhibited, though graphic scores like Divan I Shams I Tabriz, 1970, and Requiem for the Party Girl, 1972, are both mentioned. Other works exhibited possibly included the Snowforms graphic score, 1981 ; drawings from The Composer in the Classroom, 1965 ; hieroglyphs like the ones collected in the Arcana book/score, 1972 ; films or stills from Bing, Bang, Boom, NFB, 1975, or the recently released Music for Wilderness Lake, Fichman-Sweete Production, 1980. ♫ One side of the record is delivered in English and the flip in French, yet the latter is not a translation of the former. 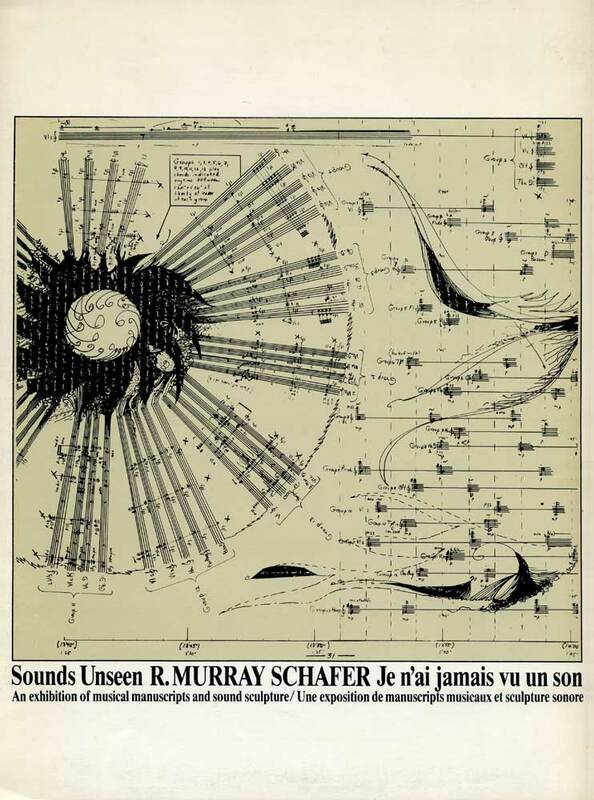 On ‘Here The Sounds Go Round’, Murray Schafer enumerates the multifarious forms and ubiquity of sounds, their “everywhere-ness” including air transmission, natural or mythical sounds, voices, noises, silence, and extending to what Murray Schafer refers to as “music seen and heard”. Above all, the speech stresses the conscious activity of listening. 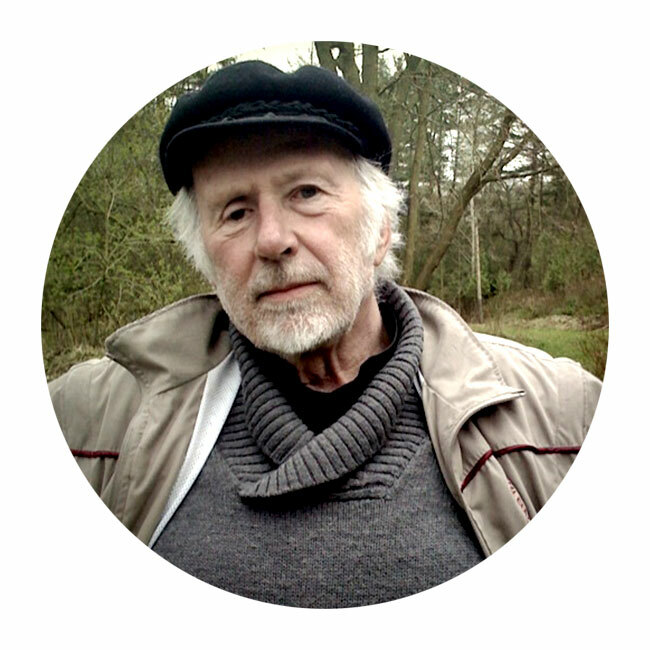 Using accessible words suitable for educational purposes, Murray Schafer’s performance is sometimes close to slam poetry as the writing makes extensive use of repetitions, cadences, internal rhymes and pauses. 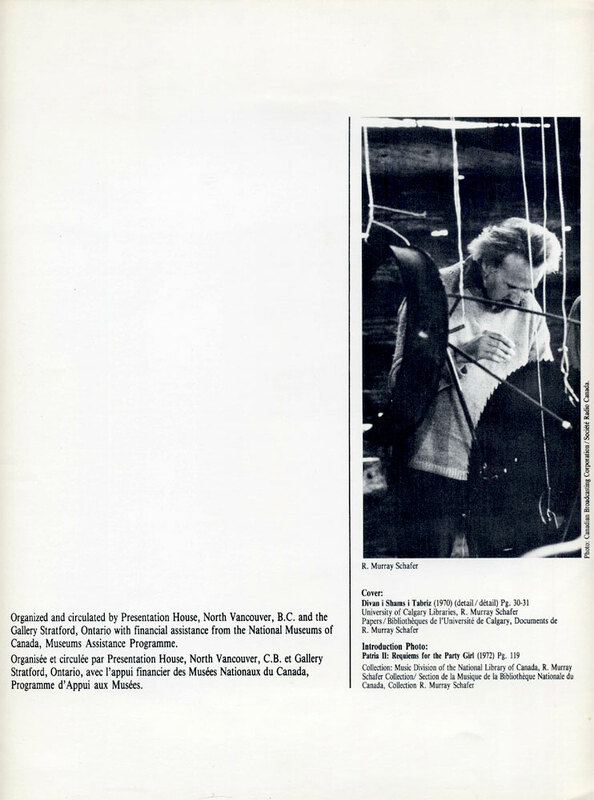 On the flip side, Canadian percussionist and composer John Wyre (1941-2006) joins Murray Schafer, to illustrate and punctuate the latter’s considerations on sounds with cymbal crashes and timpani rolls. ♫ As RA is conceived as a night-long piece, this LP merely offers key moments of the performance, and is therefore entitled RA – Selections. Said selection highlights a number of vocal pieces that might not be representative of the entire work, which also included periods of silence and various processions with instrumental accompaniment, including “Egyptian music” written by qanûn player George Sawa. In a final analysis, the disc offers yet another example of Murray Schafer’s mastering of vocal and choral music, with two of the lead singers having performed with COMUS before, namely contralto Maureen Forrester (#2) and soprano Katherine Terrel (#4). The lyrics are entirely based on the Ancient Egyptian text established with University of Toronto Egyptologist D.B. Redford. The music is essentially provided by percussion instruments, with the exception of violin and qanûn. Some sections with qanûn part reminds Soliman Gamil’s music, while the percussion sometimes sounds like a Chinese opera’s liveliest moments. 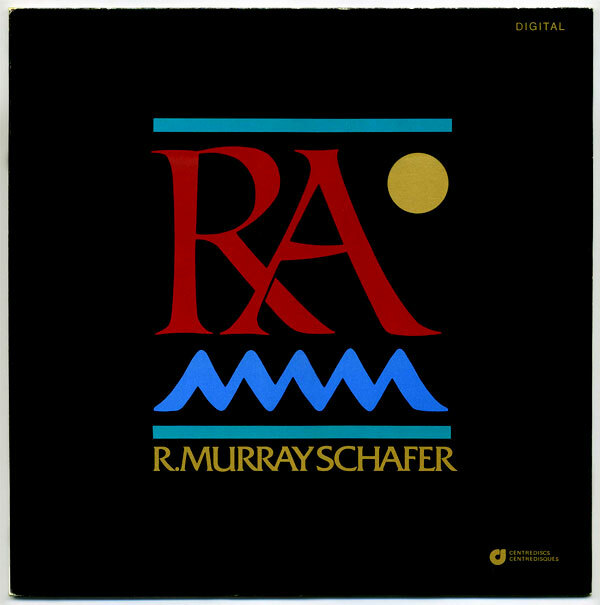 The score of RA is beautifully illustrated by Murray Schafer’s drawings, some of them included in the LP liner notes (see scans in d/l file below). 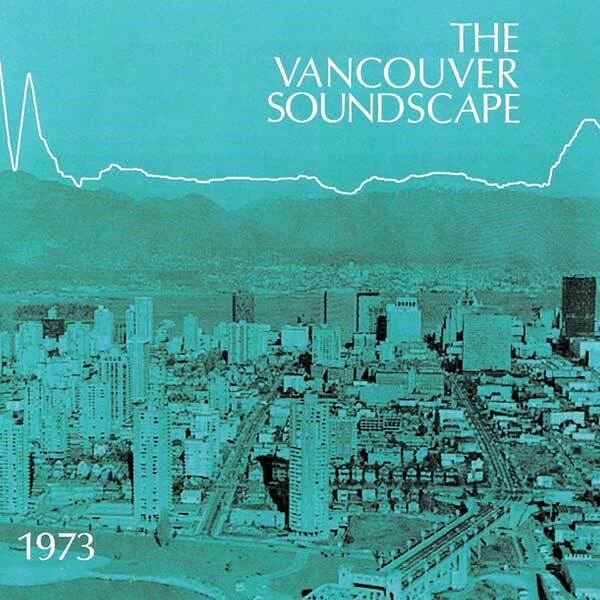 When this LP was released in 1973, Raymond Murray Schafer was busy with his World Soundscape Project, identifying and documenting the global soundscape with a group of students and volunteers from Vancouver’s Simon Fraser University. 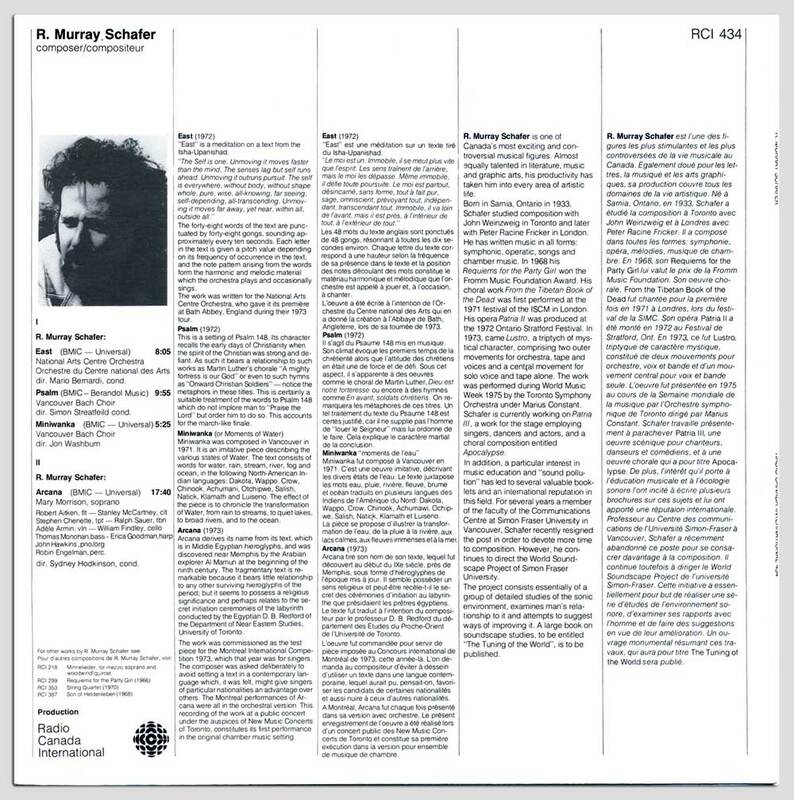 Yet, in the period where he was involved in the WSP (1972-82), Murray Schafer kept on composing for orchestra and voices, his other medium of choice. 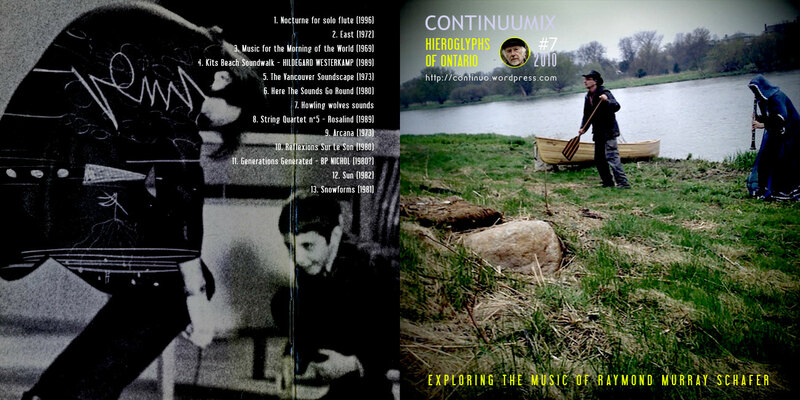 For an introduction to Murray Schafer’s sound world, please refer to Continuumix #7 – Hieroglyphs of Ontario, a mix published some weeks ago on this blog. 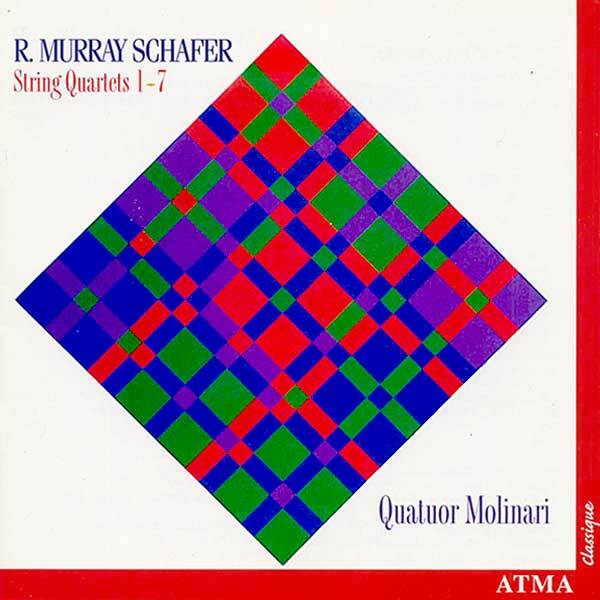 ♫ Taking his inspiration from poetry, mythology and Nature, the compositions for orchestra and choir collected on this disc showcase Murray Schafer’s immense skill for orchestral evocations and original use of onomatopeia and wordless speech. The extraordinary East combines eerie notes from horn section, atonal string glissandi and oriental sounding gongs punctuating the syllabic declamation of the poem. The Vancouver Bach Choir is the hero of Psalm, an epic composition based on Psalm 148, where the choir’s vocal flexibility is used in alternating sequences of mythological grandeur, human frailty and ineffable holiness. Murray Schafer’s various obsessions coalesce in the exquisite Miniwanka for choir, with lyrics based on North American native tribes’ words for ‘water, rain, stream, river, fog and ocean’. The composition actually describes successive states of water, from serene river flow to rain drops, from running water to the vast sea. The small orchestral formation of Arcana contributes to the secret ceremony dimension of the lyrics, based on Egyptian hieroglyphs. The undecipherable poetry uttered by soprano Mary Morrison is reflected in the sparse, elusive instrumentation. This mix is intended as a tribute to a composer whose philosophy and music have deeply influenced the inception of this blog. Various pioneering aspects of Raymond Murray Schafer‘s oeuvre have been included: Soundscape and Acoustic Ecology, vocal and choral music, orchestral and chamber music with echoes of Ives, Webern and Shostakovitch, outdoor music performed in the open, graphic scores and spoken word. 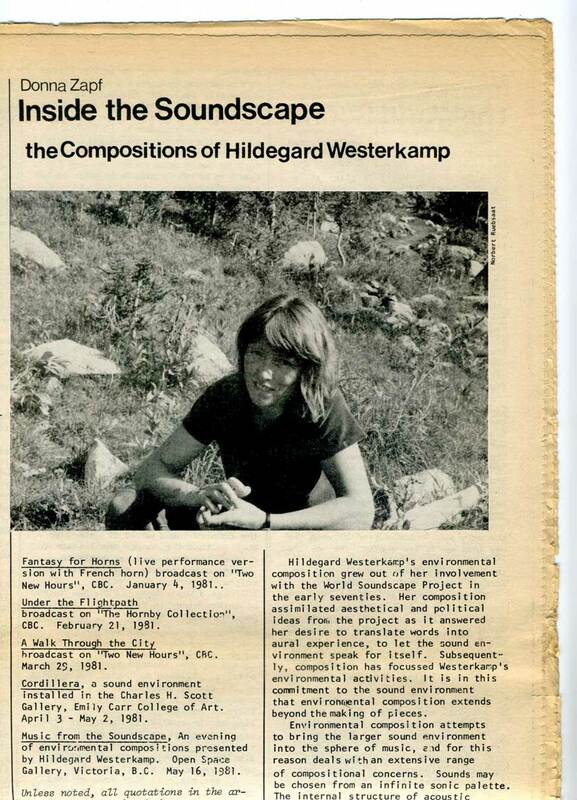 A track by Hildegard Westerkamp, Murray Schafer’s close associate in the World Soundscape Project, 1973-80, is also included, as well as sound poetry by his friend bp Nichol, whose death inspired the String Quartet n°4 in 1989. Both Murray Schafer and Westerkamp gave lectures at the Uses and Abuses of Sound conference that took place in Koli, Finland, last week (June 16-19, 2010). All music excerpts from personal collection, except where noted. Color pictures above from Miss Mussel’s post on a Murray Schafer-inspired soundwalk, as part of Open Ears Festival 2009, Kitchener, Ontario. Poet Rae Crossman is seen with an oar. Snowforms graphic score from Musicworks journal #16, Toronto, 1981. Ellen Waterman, flute. Recorded by Gayle Young at Wildcat Lake, Haliburton Forest and Wild Life Reserve, Central Ontario, 1998. From Musicworks magazine+CD #72 , Toronto, 1998. National Arts Centre Orchestra, Mario Bernardi, conductor. 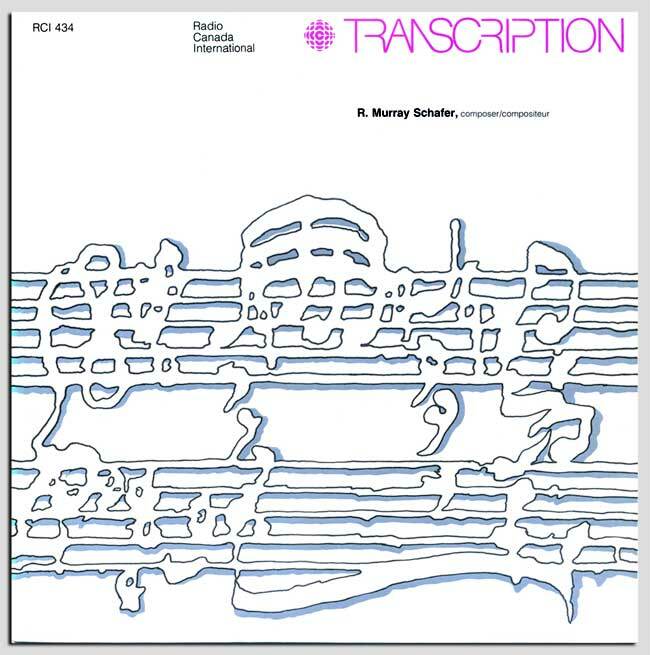 From the Transcription series LP published by Radio Canada International, 1973. Based on a text from the Isha-Upanishad. For mezzo-soprano and magnetic tape. Kathy Terrell, mezzo-soprano. 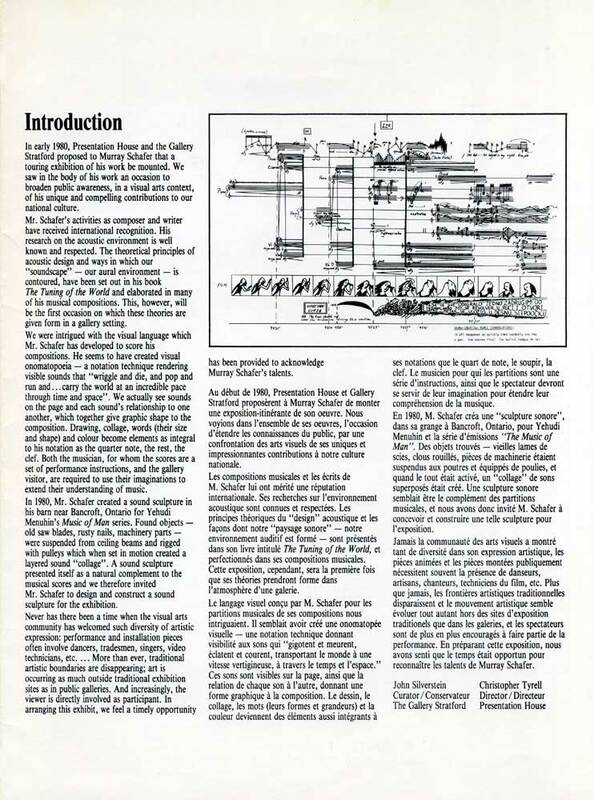 The excerpt is the 2nd half of the piece with prominent electronic sounds. Based on lyrics by Turkish poet Jalâl al-Din Rûmi. From the 2xLP Loving, Melbourne Records, Canada, 1979. For spoken voice and tape. Field recording made on Kitsilano Beach, Vancouver. Based on Westerkamp’s mid-1980s Soundwalking radio show experiments. An excerpt from Iannis Xenakis’ Concret PH 2 is embedded at the heart of the piece. 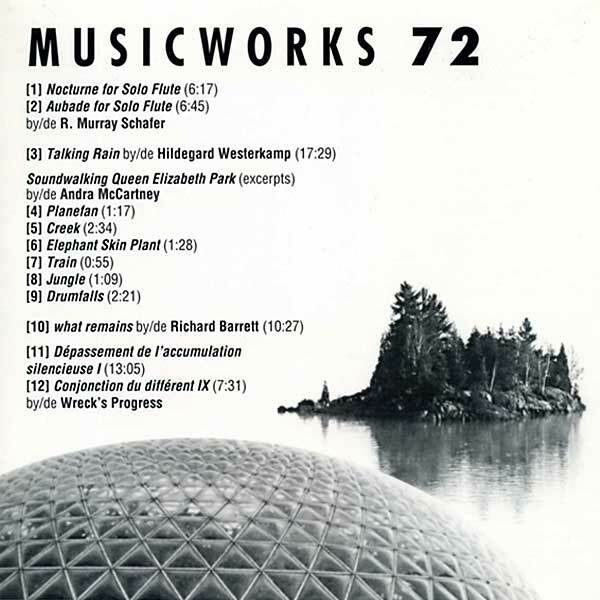 From the Transformations CD on Empreintes Digitales, Montréal, 1996. 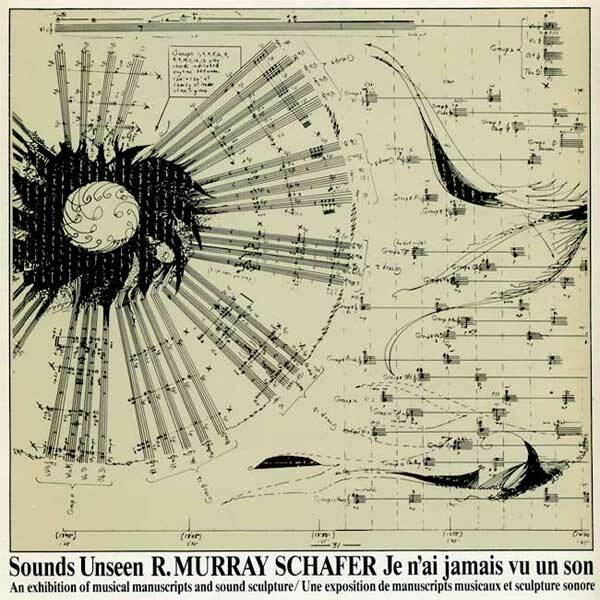 Urban sounds from Murray Schafer’s World Soundscape Project first LP. Recorded by Howard Broomfield, Bruce Davis, Peter Huse and Colin Miles. From the Cambridge Street CD reissue, Vancouver, 1996. 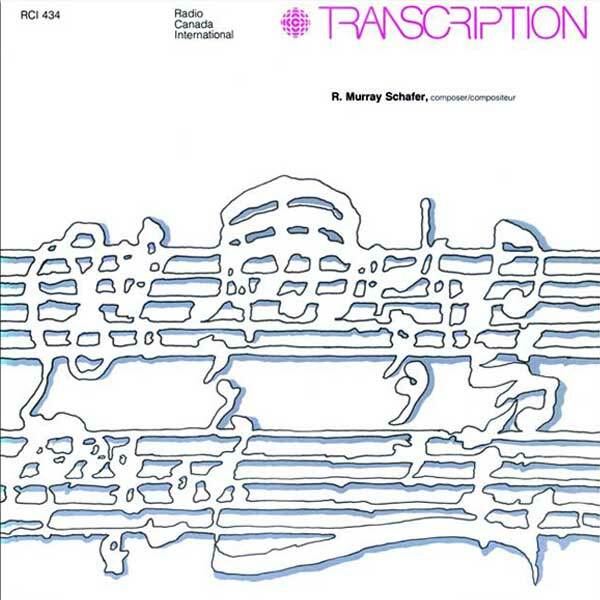 Murray Schafer reads own text, from Sounds Unseen, flexidisc issued by Presentation House and Gallery Stratford, Ontario, 1980. Howling wolves sounds from the internet. 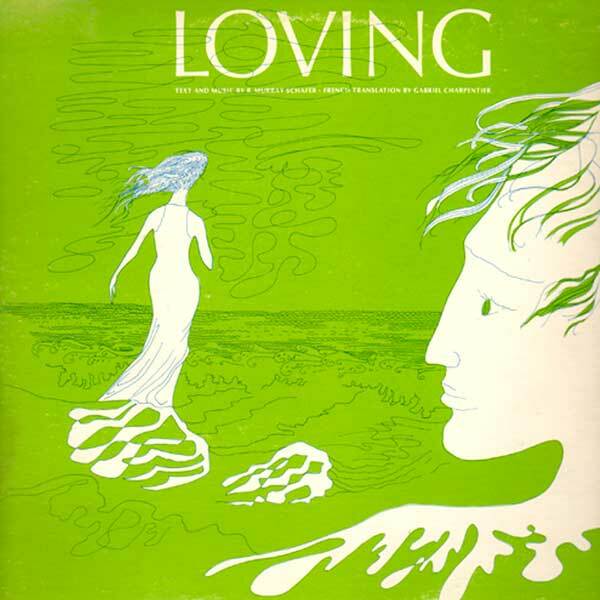 String Quartet n°5 – Rosalind (1989). Excerpt features the Wolf Theme, a transcription of the animal’s howl. From the Quatuor Molinari 2 CD set on ATMA Classique, Québec, 2000. Mary Morrison, soprano. Chamber ensemble conducted by Sydney Hodkinson. Based on Middle Egyptian hieroglyphs. 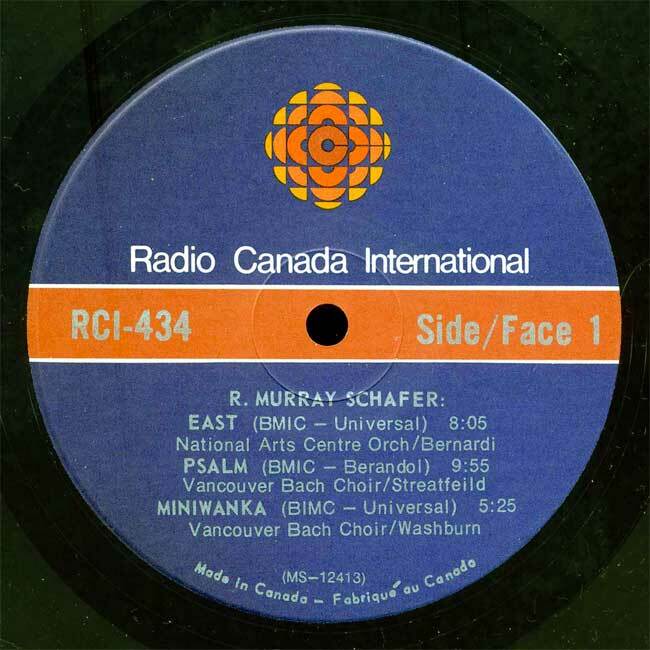 From the Transcription series LP published by Radio Canada International, 1973. Murray Schafer reads own text, in French. 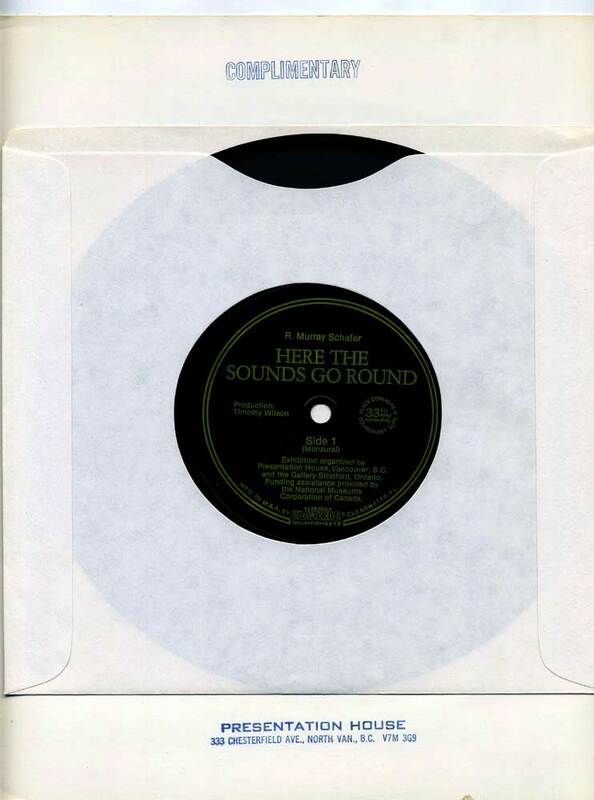 From Sounds Unseen, flexidisc issued by Presentation House and Gallery Stratford, Ontario, 1980. From the Ear Rational: Sound Poems 1966-1980 cassette. Retrieved from PennSound. For a capella chorus. The Elmer Iseler Singers. From a compilation 2xLP titled Premiere, Canadian Music Center, Centrediscs, 1984. For chidren’s choir. Here interpreted by a woman’s choir, the Vancouver Chamber Choir. 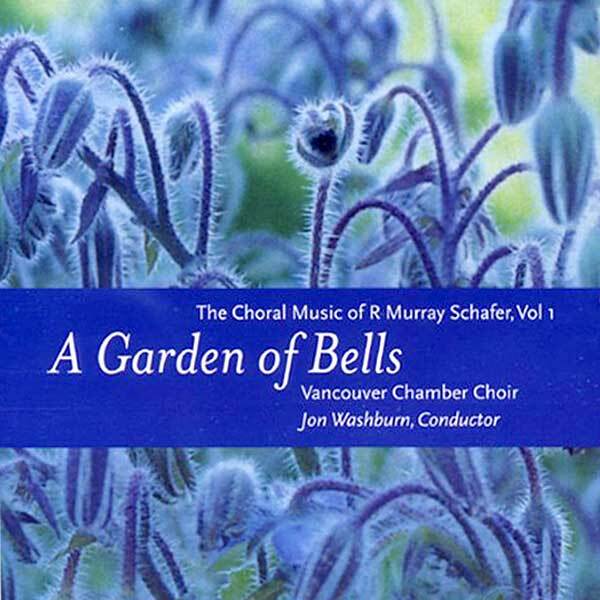 From A Garden of Bells – The Choral Music of R. Murray Schafer CD, Grouse Records, 2008. Snowforms‘ graphic score (pictured above) was conceived as an equivalent of a snow storm.